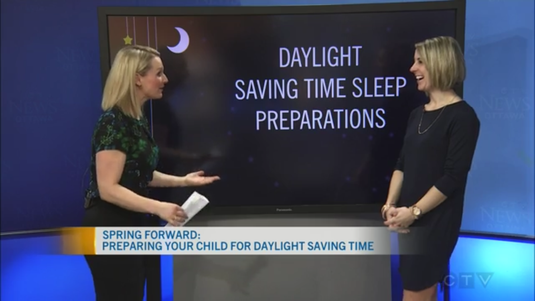 If the upcoming time change still has you a bit nervous about disruptions in your child’s sleep schedule, here are some strategies that Erin shared with CTV Morning Live! March 4, 2019: While the Fall Back of the clocks in November has most parents running for the hills (especially if your child is already an early riser), the Spring Forward that occurs each March has most adults rejoicing. No 5:07 a.m. staring you in the face this time! Cue the parental high fives! Yes, the moving forward of the clocks by one hour is generally much easier on families with young children than the dreaded Fall Back. However, if the upcoming time change still has you a bit nervous about disruptions in your child’s sleep schedule, here are some strategies that Erin shared with CTV Morning Live! 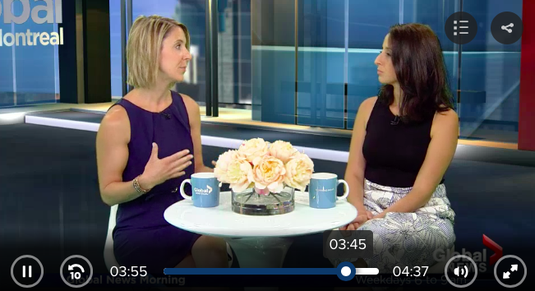 Erin Junker, Owner of The Happy Sleep Company, chats with Laura Casella of Global Montreal Morning about keeping sleep on track during travel and vacation! 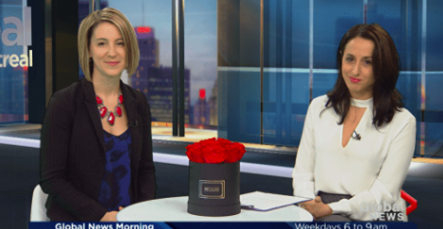 February 11, 2019: Erin Junker, Owner of The Happy Sleep Company, chats with Laura Casella of Global Montreal Morning about keeping sleep on track during travel and vacation! Erin Junker, Professional Infant & Toddler Sleep Consultant, and Erica Fraser, found of Mom Break, speak with Annette Goerner of CTV Morning Live about when and why parents hire a sleep coach. 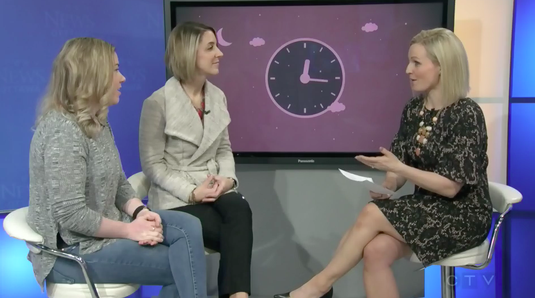 January 22, 2019: Erin Junker, Professional Infant & Toddler Sleep Consultant, and Erica Fraser, found of Mom Break, speak with Annette Goerner of CTV Morning Live about when and why parents hire a sleep coach. Erin Junker, Founder of The Happy Sleep Company, talks to CTV Morning Live's Annette Goerner about holiday sleep tips! December 18, 2018: Erin Junker, Professional Infant & Toddler Sleep Consultant and Owner of The Happy Sleep Company, chats with CTV Morning Live's Annette Goerner about how to keep baby and toddler sleep on track over the holiday season. More info on all the products discussed in this segment on the Sleep Must Haves page! 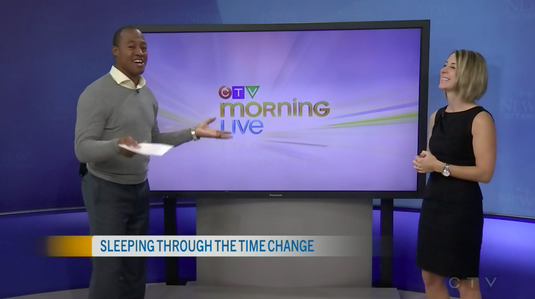 October 26, 2018: Erin Junker, Owner of The Happy Sleep Company, discusses the end of Daylight Saving Time with Henry Burris of CTV Ottawa Morning Live, and how you can adjust your little one's sleep schedule to help with the change! August 20th, 2018: Erin Junker, Infant & Toddler Sleep Consultant and Owner of The Happy Sleep Company, chats with Annette Goerner of CTV Morning Live about getting sleep back on track for the school year. Erin's best back-to-school sleep tips are shared with the Global Montreal Morning show! 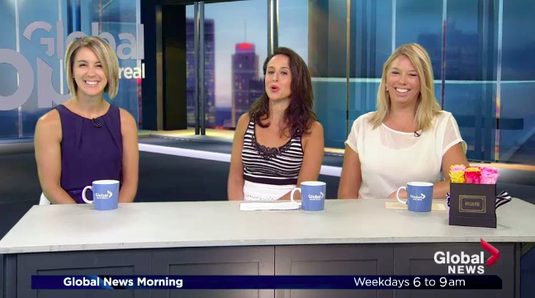 August 15th, 2018: Infant & Toddler Sleep Consultant and Owner of The Happy Sleep Company, Erin Junker, discusses back-to-school sleep scheduling tips with hosts Laura Casella and Kim Sullivan of Global Montreal Morning! Erin Junker speaks with Henry Burris of CTV Morning Live about keeping sleep on track while camping! July 23rd, 2018: Erin Junker, Owner of The Happy Sleep Company, gives Henry Burris of CTV Morning Live some camping-with-kids sleep tips! Erin Junker speaks with Henry Burris of CTV Morning Live about summer sleep schedules for kids! June 27th, 2018: Erin Junker, Owner of The Happy Sleep Company, chats with Henry Burris of CTV Morning Live about keeping sleep on track while enjoying these gorgeous summer months! 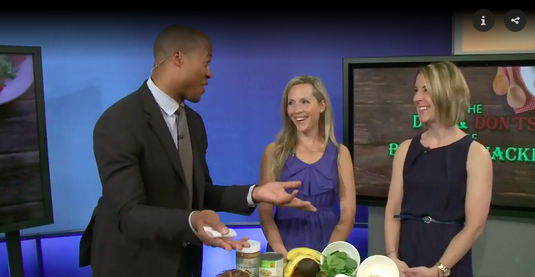 May 14th, 2018: Erin Junker, Owner of The Happy Sleep Company, and Natasha Onley of Caven Nutrition Group chat with Henry Burris of CTV Ottawa Morning Live about the "Do's" and "Don'ts" of bedtime snacking! Erin Junker, Professional Infant & Toddler Sleep Consultant and Owner of The Happy Sleep Company, chats with Henry Burris of CTV Morning Live Ottawa about how to make sleep adjustments for children during Daylight Savings Time. March 9th, 2018: Erin Junker of The Happy Sleep Company chats with Henry Burris of CTV Morning Live Ottawa about sleep adjustments for children for Daylight Savings Time! 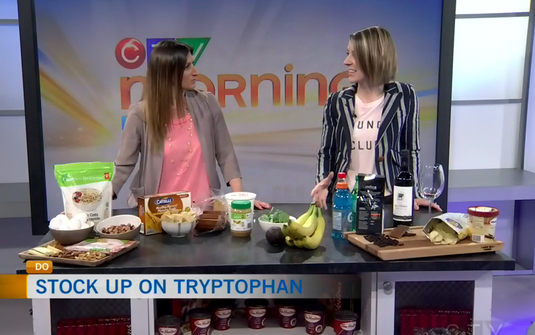 Erin chats travel sleep tips with Daytime Ottawa! March 8th, 2018: Erin Junker discusses The Happy Sleep Company's tips for keeping kids' sleep on track during vacation, with Dylan Black of Daytime Ottawa. 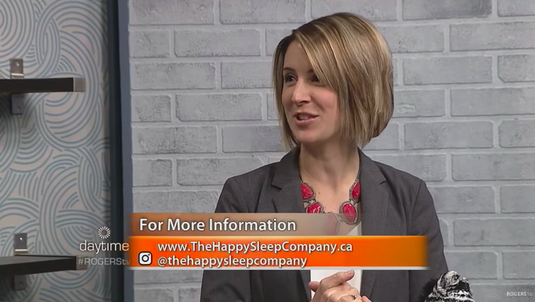 Erin Junker, Professional Infant & Toddler Sleep Consultant and Owner of The Happy Sleep Company, chats with Dylan Black of Daytime Ottawa to provide tips on how to help families proritize sleep, even when life gets hectic! January 11th, 2018: Erin Junker, Owner of The Happy Sleep Company, chats with Dylan Black of Daytime Ottawa to provide tips on how to help families prioritize sleep, even when life gets hectic! Erin Junker, Owner of The Happy Sleep Company, discusses how to get sleep back on track after the holidays with Global Montreal's Laura Casella. January 4th, 2018: Sleep get off track during the holidays? Let's re-establish great habits and get healthy sleep started for the new year! Erin Junker, Owner of The Happy Sleep Company, chats with Laura Casella of Global TV Montreal about getting sleep on track for 2018! 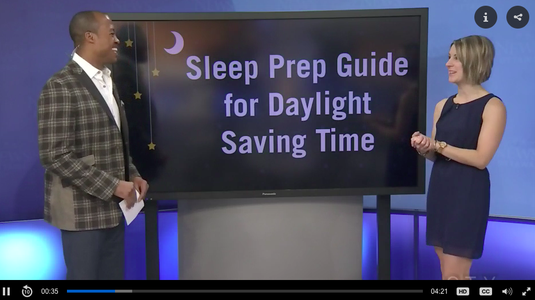 Erin Junker of The Happy Sleep Company chats with Henry Burris of CTV Morning Live about tips for managing sleep during Daylight Savings Time. October 23, 2017: Daylight Savings Time is on its way! The clocks will be turned back an hour as of 2 a.m. November 5th, which can be a little scary for the parents of early rising children! 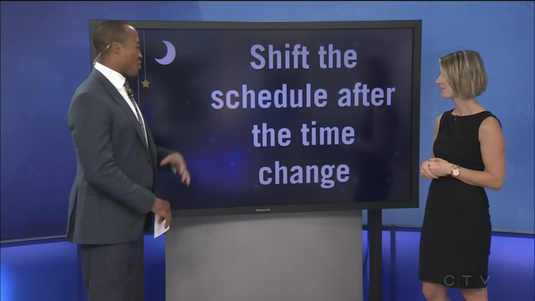 Check out The Happy Sleep Company's tips for managing the DST change in her chat with Henry Burris of CTV Morning Live. Erin Junker, Owner of The Happy Sleep Company, chats with Dylan Black of Rogers Daytime Ottawa. August 15, 2017: The sleep "stuff"! 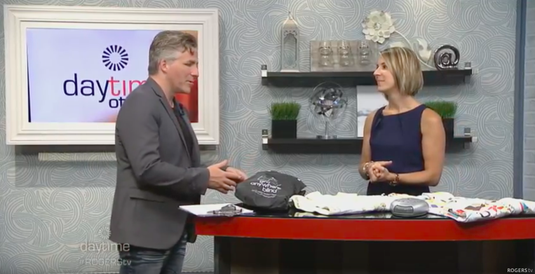 The Happy Sleep Company chats with Rogers Daytime Ottawa about all Erin's favourite sleep items for babies and toddlers! 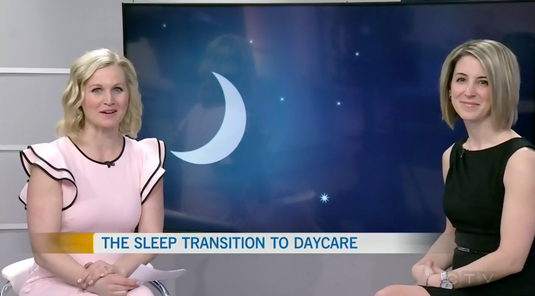 Erin Junker, Infant & Toddler Sleep Consultant and Owner of The Happy Sleep Company, chats with Lianne Laing of CTV Morning Live Ottawa about getting sleep back on track for the start of the school year! Back to school time! August 15, 2017: Back-to-school time! (Well, almost!) 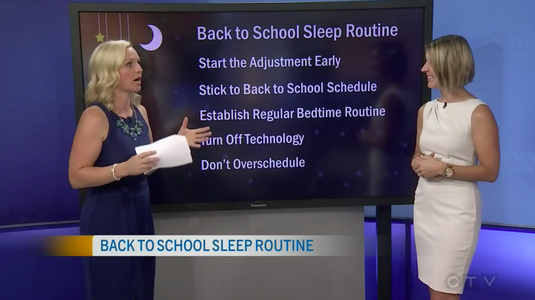 Start the sleep adjustment now by checking out The Happy Sleep Company's tips from Erin's chat with CTV Morning Live Ottawa on how to get sleep on track for the start of the school year! 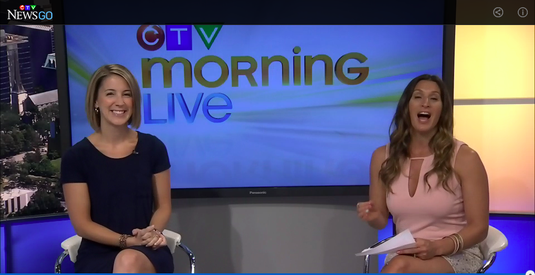 Erin Junker, Infant & Toddler Sleep Consultant and Owner of The Happy Sleep Company, chats with Lianne Laing of CTV Morning Live Ottawa about getting great sleep for your little ones while camping this summer! July 13, 2017: Camping tips! 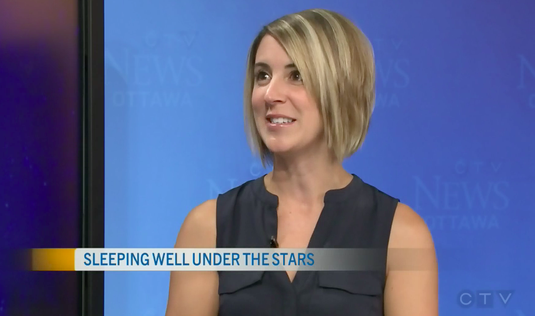 Erin Junker, Professional Infant & Toddler Sleep Consultant and Owner of The Happy Sleep Company, chats with Lianne Laing of CTV Morning Live Ottawa about keeping little ones' sleep on track while enjoying a fun-filled camping trip! Erin Junker, Infant & Toddler Sleep Consultant and Owner of The Happy Sleep Company, chats with Laura Casella of Global Montreal about summer sleep for infants and toddlers. July 4, 2017: Sleep tips to keep your little one comfy and rested in these warm and busy summer months! Erin Junker of The Happy Sleep Company chats with Laura Casella on Global Montreal's morning show about summer sleep. 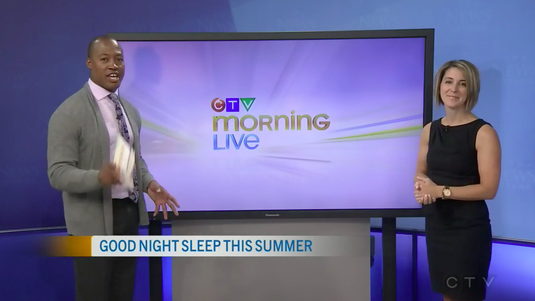 Erin Junker, Infant & Toddler Sleep Consultant and Owner of The Happy Sleep Company, chats with Stefan Keyes of CTV Morning Live Ottawa about summer sleep tips for parents of young children. June 22, 2017: School's (almost!) out for the summer! 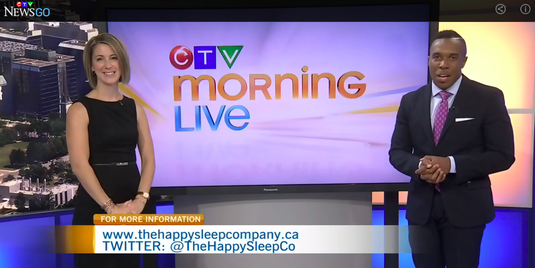 Keep sleep on track with these summer sleep tips from The Happy Sleep Company's June 22nd CTV Ottawa Morning Live segment! April 26, 2017: The "Do"s and "Don't"s of bedtime snacking! 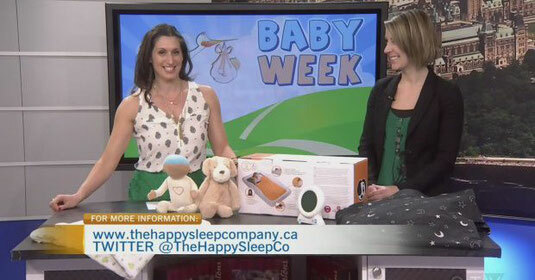 Check out tips from Erin Junker, Owner of The Happy Sleep Company, on CTV Ottawa Morning Live! March 27, 2017: Most children are ready to drop their mid-day nap between the ages of 3-4. Erin Junker of The Happy Sleep Company speaks to Henry Burris of CTV Morning Live about the signs that your child may be ready to drop the nap, and how to help the transition to no-nap go smoothly. March 8, 2017: With March Break quickly approaching, Erin Junker, Owner of The Happy Sleep Company, chats with Lianne Liang and Henry Burris of CTV Morning Live about the best ways to keep sleep on track during travel. 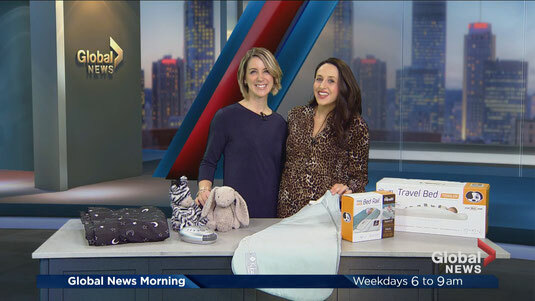 February 23, 2017: Erin Junker, Professional Infant and Toddler Sleep Consultant and Owner of The Happy Sleep Company, chats with Lianne Liang of CTV Morning Live about her favourite baby sleep accessories!